China says almost $150bn (£75bn) is needed to rebuild the region devastated by the 12 May Sichuan earthquake. The sum, over one-fifth of government tax revenue in 2007, will be used to rebuild the 51 worst-hit areas, China's top economic planning agency said. It will be used to replace schools, hospitals and housing across the region, the agency said. 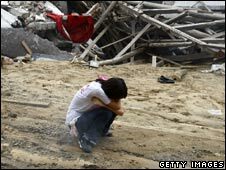 More than 70,000 people were killed by the powerful earthquake, and another 18,000 remain missing. Five million people were made homeless, while infrastructure across a swathe of southwest China was damaged. In a draft report on quake rebuilding, the National Development and Reform Commission said one trillion yuan ($145.7bn) was needed to fund reconstruction efforts. 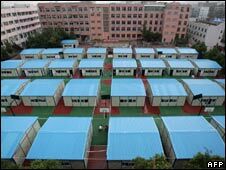 About 3,400 primary schools will be rebuilt in Sichuan, Gansu and Shaanxi provinces, China Daily quoted the report as saying, and safety standards will be improved at another 2,600 schools. Grieving parents who lost children in the quake have raised questions about why so many schools collapsed - pointing to shoddy construction and local corruption. "We need to strictly implement construction standards when building public facilities, particularly schools and hospitals," the newspaper quoted the report as saying. Three million houses are needed in rural areas and almost one million urban apartments, the report said, while jobs need to be provided for one million people. China drew widespread praise for its initial response to the devastation caused by the earthquake. But millions of people are still living in temporary housing and reconstruction looks set to take several years. Aftershocks are continuing to rock the region and many people remain traumatised by the earthquake, correspondents say.